Impression of EDRS high-speed feeder link relays to Europe. Image courtesy of ESA. Satellite remote sensing is set for a speed turbo boost with the launch of the less than snappily named EDRS. The first node of the European Data Relay System (EDRS), which is effectively a space based satellite data super highway, was launched last Saturday. Most satellites send data back to Earth only as they pass over ground receiving stations. In addition, they have an orbital track that takes them across the entire planet, travelling at speeds of around 7 000 miles per hour, which means they are only in range of a single receiving station for approximately 10 minutes of each orbit. Given the size of Earth observation (EO) datasets, there are limits to the speed EO data can be sent back from space and it becomes increasingly difficult to download the full amount of data that can be collected. This is partially offset by having a network of ground receiving stations across the world. For example, Landsat has an international ground station (IGS) Network that includes three stations in the USA alongside 15 in other countries across the world. The EDRS works in a different way. It is based in a much higher orbit than many EO satellites, an orbit called geostationary, which means that the satellite remains above the same place on Earth at all times and thus is in constant contact with its ground station. 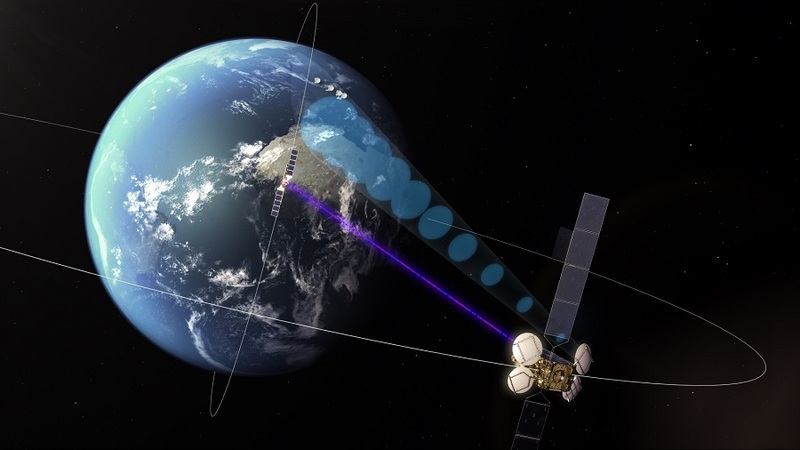 ERDS collects data from EO satellites by laser, and can stay in contact with the satellites for a much longer period because of its higher height. Once the EDRS has received the data, it immediately relays the data to its ground station. EDRS-A was launched by piggybacking the Eutelsat 9B satellite, whilst a second satellite, curiously called EDRS-C, is due to launch in 2017. The International Space Station will also be connected up in 2018, and a third satellite is planned for launch in 2020 and will sit over the Asia-Pacific region. It will require further satellites to provide twenty-four hour all orbit data relay coverage. After a significant testing phase, EDRS is expected to go into service this summer. The European Commission’s Copernicus Programme will be the first major customer, relaying data from its Sentinel satellites. Once fully operational the system will be capable of relaying up to 50 terabytes of data each day at speeds of up to 1.8 gigabits per second, which is about 90 to 100 times faster than a typical internet connection. Rescue and disaster relief teams that need EO data to focus and support their work. Monitoring fast moving environmental issues such as forest fires, floods, pollution incidents and sea ice zones. Government and security services that could utilise real time data to support their aircraft and unmanned aerial observation vehicles. Monitoring of illegal fishing or piracy events. EDRS will certainly supercharge EO and remote sensing, offering new opportunities for the provision of near real time applications to a variety of users. This entry was posted in Copernicus, Data, Earth Observation, ESA, Landsat, Remote Sensing, Satellite communications, Sentinel, Service, Space Can Help, Space Industry, Understanding Space and tagged Copernicus, Earth Observation, EDRS, EDRS-A, EDRS-C, EO, European Data Relay System, geostationary, Ground receiving stations, International Ground Station Network, Landsat, remote sensing, satellite, Sentinel by Andy. Bookmark the permalink.